rec. Haden-Freeman Concert Hall, Royal Northern College of Music, Manchester. CD1: 26 January, 3 February and 24 February 2010; CD2: 24 February, 14 April and 16 April 2010; CD3: 21 October 2009 and 4 January 2010. I was telling a friend about the arrival of Ronald Stevenson’s piano music CDs on my doorstep. What surprised him most was that for once in my life I was lost for words. My usual methodology for a review would be to work through the track-listings in either batting or chronological order, making comments on each. However, this is beyond me in this instance. Firstly, I was overwhelmed by the sheer width and depth of the repertoire. Secondly, every piece is brand new to me: I felt that it would take longer to absorb this music than a decent turn-around time for a review would normally demand. Thirdly, I felt that if I were to comment or analyse each track I would end up writing an essay the size of a large dissertation. This brought me back to point one. I am so reliant on the liner-notes for historical and contextual information that the reader may as well read them as my review. However, something demands to be said. What I propose to do is to give a thumbnail sketch of the composer and his music (a hopeless task! ), briefly consider the ‘genres’ of piano music presented, and finally pick out two or three groups of works that impressed me most on first or second hearing. Ronald Stevenson is one of the most important living composers. Alas, he is probably best known for having composed what is regarded as ‘the biggest single-movement work in the piano literature’ the Passacaglia on DSCH, which is some 80 minutes long. The Symphonic Nocturne for Piano Alone by Sorabji is actually longer. This is unfair. Stevenson has written a huge range of compositions in virtually every genre with the exception of symphony (excepting the massive Ben Dorain) and opera; there is an early Berceuse Symphonique. There are four impressive concertos – two for piano, one for fiddle and one for cello. Stevenson has contributed handsomely to vocal music with many settings of Scottish and English poets including Hugh MacDiarmid, William Soutar, Robert Louis Stevenson and William Blake. Nor has he ignored poets from other cultures - there are setting of the Japanese poet Basho, the Vietnamese Ho-Chi-Minh and the American Edgar Allan Poe. Other music includes a number of choral settings, an impressive list of choral works and educational music. One of the largest categories in his catalogue is for piano: there are in excess of 500 pieces/works/movements for that instrument. 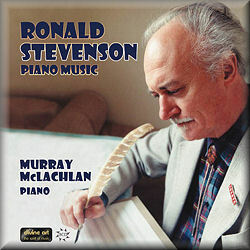 Ronald Stevenson is also a great pianist. He is in the trajectory of the grand romantic pianists of the past such as Busoni, Leopold Godowsky, Percy Grainger and Paderewski. Later exponents of this style of playing included John Ogdon and Earl Wild. However it is Busoni and Godowsky that I feel reflects much of the music presented in these three CDs. I do not wish to develop a debate about the differences between transcription, arrangement and paraphrase, however it needs to be understood that these nouns are applicable to the vast majority of pieces in the collection. Three loose definitions may not go amiss. Firstly an arrangement is quite simply an adaptation of a musical work for another instrument or ensemble than it was originally intended. Secondly a transcription, leads on from an arrangement, but usually introduces ‘more or less imaginative changes’ which may or may not be taken as conforming to the composer's own procedure, if he had written for the medium. Finally, a Paraphrase is usually seen as being a solo work of ‘great virtuosity’ in which well known melodies were considerably elaborated. All three practices are presented on this CD. However there can often be a wee bit of blurring around the edges. A good summary of Stevenson’s place in the musical sphere is given in the liner notes: ‘If we reject, as too superficial, the standard distinctions between transcription and free composition, one comes close to understanding Stevenson’s outstanding corpus of music. Of course, individual pieces vary enormously both in terms of approach and in terms of style. It is as though Stevenson’s music as a whole becomes a kind of meeting place for kindred and diverse spirits.’ For this reason, I believe that it is not possible to describe what Ronald Stevenson’s music ‘sounds like’. I want to look at two groups of works –the Chopin and the Purcell pieces. However before that I believe that the opening track acts as a kind of ‘prelude’ to the entire CD set. This transcription of Bach’s Komm, süsser Tod (Come sweet death) BWV 478 was made in 1991 on the ‘birthday’ of Busoni. The sleeve-notes suggest that this piece is a ‘modest curtain raiser’ – well it may be comparatively modest in terms of the ‘massiveness’ of Stevenson’s music, however for me this rework of the original is both highly romantic and deeply moving. The sentiment of the original has been retained in its entirety, but re-presented in a musical language alien to, but complementary to, Bach’s intention. It is dedicated to Leopold Stokowski, who gave much encouragement to Stevenson. A good place to begin a detailed exploration of these CDs would be with the seven ‘Purcell’ numbers. The ‘Little Jazz Variations on Purcell’s ‘New Scotch Tune’’ is a work that has been revised and added to over the years. It is a lovely, moody piece that is more ‘bluesy’ than ‘jazzy’. The preceding Purcell ‘Toccata’ was composed in 1955. In the composer’s opinion it is ‘a very fine transcription which is respectful and newly individual; traditional and exploratory ... musicological ... and inventive – Yes!’ It works well for piano. The ‘Three Grounds (after Purcell)’ date from 1995. Once again these are beautifully contrived pieces that take the original material written for strings and literally recreate them for the piano. These are attractive retrospective tunes that typify Stevenson’s ability to view earlier composers through his own compositional lens. The ‘Hornpipe’ and ‘The Queen’s Dolour (A Farewell)’ are equally effective: however the former seems further from Purcell’s intention with its hard-edged harmonies than the latter, which is heart-achingly lovely. The first CD contains the ‘complete’ Stevenson/Chopin transcriptions and paraphrases. The liner-notes point out that Leopold Godowsky’s ‘53 Studies Based on Chopin Etudes’ had a huge impact on Stevenson ‘as both a composer and pianist’. The Pénseés sur des Préludes de Chopin are dark and introverted: each number is prefaced by a quotation from the French philosopher Pascal. Stevenson picks and chooses bits and pieces of Chopin’s music and combines and recombines them at will. It is a deep work that seems to transcend the original. I enjoyed, if not quite related to, this adaptation. However, some listeners would rather that Stevenson had not ‘tinkered’ with what most regard as original masterpieces. Other fine works on this CD set include the delicious ‘L’art du chant appliqué au piano – Volume 1 & 2’ which are transcriptions, re-workings, paraphrases, arrangements (call them what you will) of a number of well-kent tunes such as Frank Bridge’s ‘Go not, Happy day’, Ivor Novello’s ‘We’ll gather lilacs’, and Samuel Coleridge-Taylor’s ‘Demande et Réponse’ (from Petite Suite de Concert Op. 7). Other composers represented in these two volumes include Meyerbeer, Maud Valérie White, Sigmund Romberg and Sergei Rachmaninov. They are invariably a joy and a pleasure to listen to. Then there is the massive Le Festin d’Alkan: Concerto for Solo Piano with its three movements: Free Composition, Free Transcription and Free Multiple Variations. So much could be said about this work that, in the composer’s words “encapsulate my idea that composition, transcription and variation are all essentially the same thing”. I was extremely impressed by Murray McLachlan’s playing on these three superb discs. This complex, usually technically difficult - if not nearly impossible, at times - music demands a huge technique and considerable confidence to play and interpret successfully. In recent years, I have reviewed McLachlan’s stunning cycle of Erik Chisholm’s piano music, so it came as no surprise that he brought the same commitment, dynamism and sensitivity to the pages of this music. This is a major project representing a cross-section of Ronald Stevenson’s music for piano. Yet it serves as a perfect ‘introduction’. I am not sure whether ‘Divine Art’ mean to issue further releases of the composer’s music, however just glancing at the list of piano music on the Stevenson Society Webpages suggests that there is enormous potential for the future. The liner-notes by Murray McLachlan are excellent, comprehensive and interesting. They do require to be read before addressing this music. This is not because the works need explanation before enjoyment, but simply to put them into context. This is an important release. I hope that it will act as a spur to other performers and record companies to examine more of this composer’s scores. However, the present 3-CD set will long remain as a monument to the achievement of Ronald Stevenson.